Puppies And Older Dogs - Can It Work? HomeBehavior & TrainingPuppies And Older Dogs – Can It Work? Puppies And Older Dogs – Can It Work? Mixing puppies and older dogs can be can be like creating the perfect PB&J… or it can be more like trying to blend oil and water! If you’re planning on introducing a new puppy, or another adult dog, into a home with a resident senior…. … how successful it is mostly depends on the personality, health, and social skills, of your older dog. The first few days, or weeks, may be a bit ‘rocky’ or at the very least, interesting. But most dogs will accept a newcomer into their pack given time and space. But, if this is the first time you’ve tried to bring a younger pup or dog into a home with a ‘golden oldie’, you might be wondering exactly what IS normal in this situation…. and when you should be concerned, or intervene. Over the decades we’ve added, and sadly lost, canine family members many times. Does he generally like and tolerate other dogs or pets? Is he just a little unsociable? What is his health like? What’s Normal and When Should I Worry? Before I talk about what to expect when you first bring your new pup home…. If you do these three things and you give yourselves the best possible chance of becoming one big-ger, happy family! How should you handle the introductions? What will the first days/weeks be like? …. and when should you step in? How will you know if there’s a real problem? What will you do if there IS a real problem? How you handle the introductions between puppies and older dogs largely depends on your resident senior’s personality. If so, chances are good that he won’t take an instant dislike to the ‘new kid on the block’ (but that could still change once he realizes the new kid is here to stay!). Even if you’re sure that Fido won’t hate Fido Jr. on sight, take the introductions slowly and have another person on hand to help things run smoothly. Most dogs will want to thoroughly sniff the new arrival, and will stick to him like glue wherever he goes. Expect some excitement, maybe a little rough play, even some growling (usually on your senior dogs part). Puppies and older dogs have entirely different social skills and playing styles, and it takes a while for them to understand, and accept each other’s quirks. Luckily, most dogs recognize a puppy and make allowances for the inexperience of youth! The seniors tolerate more and are usually fairly gentle in their reprimands. Unfortunately puppies don’t have this sixth-sense to guide them and tend to ‘hound’ the older dog and cross all social boundaries without a backward glance! Older dogs may be wise and tolerant, but they’re not saints… and puppies who step too far over the line, or do it too often, will be corrected. If the first more gentle correction doesn’t work, growling, nipping or even physical dominance will be used. but don’t leave them alone together for at least the first couple of weeks, just to be safe. Step in only if you’re truly worried that one of them is going to get hurt (and it’s not always the puppy who’s most at risk). When that happens, correct them both, separate them for a while, and redirect each combatants attention with calm one-on-one play, or cuddles. If your older dog isn’t keen on interacting with other dogs you could have your work cut out for you to convince him that the new puppy is a good idea. This doesn’t mean it’s not possible to do…. in fact, sometimes an old dog will surprise you with his acceptance, tolerance, and love for the new arrival. But don’t go into this expecting that to happen, be prepared to have to work at it! With a resident dog who isn’t Mr. Congeniality, it often helps to make the initial introductions on neutral ground (to avoid territorial behavior). The (dogless) home of a relative or friend is a good choice, or a quiet corner of a local park (but only if the new pup is fully vaccinated so he won’t pick up a disease). You want it to be somewhere that your senior dog is already familiar with and feels comfortable in, and someplace fairly quiet. That will keep the emotional level of the meeting low-key. Have someone else hold the pup while you stay with your senior. Don’t ‘push’ them together, let any sniffing and investigation come naturally. If the pup gets too pushy, or your dog too defensive, step back and regroup. Talk quietly and reassuringly to your older dog and encourage him to be gentle. Once these initial introductions are made you can head for home, together. Walk both dog and puppy in at the same time, with your resident dog leading the way. this helps to reinforce the pack structure, without allowing your golden oldie to get territorial. Then allow the two of them to interact as naturally as possible, with you supervising at all times. If things get rough, one of them gets upset, or they get too snippy with each other, reprimand them gently but firmly, and give them both some alone time. As your older dog isn’t naturally a social butterfly, make sure he gets plenty of quiet time away from the newbie, or he could feel overwhelmed and anxious. Don’t leave puppies and older dogs like this alone together for several weeks, you need to be absolutely sure they’re friends before taking that chance. Do you have an older dog who likes to be ‘in charge’ of whoever is around – whether he knows them or not? Does he guard his ‘people’ or possessions, refuse to share his things or play with others, and growl, nip or ‘run at’ other dogs who invade his space. If your older dog has this type of personality, personally I wouldn’t recommend adding a new puppy unless you have a very good reason for doing so. At worst, a very dominant dog who doesn’t want another dog in ‘his’ space could hurt a puppy, perhaps seriously. Even at best, your home environment would be tense, and both dogs and people would be on edge. Puppies are also very impressionable and they pick up their social cues from the pack. If Fido Jr.’s first role-model is anti-social, dominant and bad-tempered, it won’t help him grow up to be a happy, confident and friendly dog! All around this situation is likely to be fairly challenging (for everyone) and may not have a happy ending. Puppies and older dogs can get along like a house on fire… but if Fido Sr. has mobility problems, is in chronic pain, has some hearing or sight loss, is frail or has old dog syndrome, adding a puppy to your home may be just too much for his old body to handle. Senior dogs also tend to rely very heavily on their established routines for security, and can become anxious as they age. Adding the stress and unsettling effect of a new puppy would most likely increase his anxiety levels. If any of these apply to your senior, then this old dog who has spent his life loving you probably deserves to spend his final years enjoying the peace of a single-dog home. 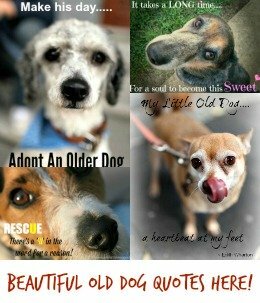 You could look into adding another older dog, maybe even a senior…. there are SO many of them condemned to spending whatever time they have left in a shelter or pound. But again, a lot would depend on the personality of both dogs, and it’s something that would need a fair bit of thought. You want to improve the life of both dogs, not make it more stressful. 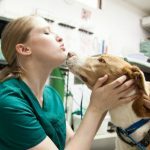 Reducing your older dogs quality of life probably isn’t what you’re aiming for, but it could happen in this type of situation. The first couple of days, or up to a week, are usually the most challenging. By the end of that period most puppies and older dogs will have accepted the presence of the other one, and will be on the way to working out a relationship. Not ALL dogs will adjust this fast, some can take weeks, but others will enjoy each other’s company from day one. So much depends on their individual personalities, that there’s really no way to tell ahead of time how it will go. But in addition to the tips above, there are some other things that you can do to help the two of them get along. Always focus on reassuring your older dog that he is still ‘Numero Uno’ in your heart, and pet, feed and play with him first. Dogs are pack animals and the pack structure needs to be stable for them to feel secure and happy. Your older dog and other family members are the ‘elders’, the puppy is the ‘newcomer’ and bottom of the heap in the dog world. So, don’t invite jealousy or de-stabilize the pack by fussing over the newbie and ignoring the senior. Puppies are undeniably adorable, and it’s very easy to spend way too much time ‘Oooh-ing’ and ‘Ahhh-ing’ over the newest little furball, but resist the temptation! Prevent Squabbles: Avoid arguments over ‘resources’ such as toys by making sure there are plenty to go around. Don’t just give Fido Jr. the shiny new ones either, make sure your senior dog has his own new, and special, toys. Don’t let the pup ‘steal’ any either! Have Special Time With Each One: Make sure each dog has special one-on-one time with you, and other family members. If your senior dog is closely bonded with you, or another specific family member, have the rest of the family interact with the puppy more so that Fido doesn’t lose his BFF. This can head-off jealousy, especially on your older dog’s part. Find Outlets For Puppy Energy: There’s a lot of truth in the old saying ‘A tired puppy is a good puppy’, so do make sure that Fido Jr. gets plenty of exercise. It will make him less of a strain on your old dog’s nerves. But don’t play a hectic game of ‘fetch’ in the backyard which your old dog can’t join in, but is left to watch from inside. Be creative, and empathetic in finding ways to exercise Jr. without upsetting Snr. Watch For Changes As Puppy Grows: Although most older dogs will tolerate puppies, even when they misbehave, at some point their ‘get out of jail free’ card expires. This usually happens when the pup becomes an adolescent (imagine the friction between a teenager and parent/guardian). Be ready to correct any misbehavior or over-reactions (by pup or senior) and act as referee for a while. 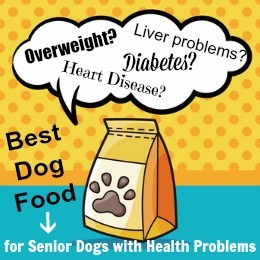 Take Your Older Dog’s Health Into Account: All dogs are different, and some seniors are hale and hearty, while others are more frail and fa….. (okay I won’t go there!). Seriously though, not every senior dog is healthy enough for a new puppy playmate. If the doggie status-quo hasn’t changed much in your home for a while, you might be wondering what to expect when puppies and older dogs get together. Or maybe your senior dog is your first dog, and you’ve never tried to ‘blend’ a canine family before. So, here are some of the things you’re likely to see, and a rough guide as to whether they’re normal, or something you need to get help with. With puppies and older dogs, this is pretty normal. It’s irritating (for Fido Sr., and for you) but normal for Jr.
He’s used to the rough-and-tumble of puppy play with his littermates, and he hasn’t yet figured out that your senior dog is not a puppy too. Pouncing on your older dogs head, tail or body is common. Pawing at this face, or biting his tail… also normal. Most good-natured adult dogs will take a certain amount of this puppy silliness before putting their paw down, but this is where your older dog’s personality comes into play. But this behavior is just one of the reasons why you don’t want to add a new puppy to a home with an old dog who’s frail or in poor health. Puppies are NOT known for being gentle. Again, this is pretty normal when puppies and older dogs get together. Puppies don’t have boundaries for their behavior and they have an endless supply of energy. But just because it’s normal that doesn’t mean you should allow it to happen. You need to protect both Fido Jr. and Fido Sr. , so if the little guy keeps taking the older dogs toys, tell him ‘no’, take them from him and give them back. Then redirect the pup’s attention to something he IS allowed to play with. Before he came to live with you, your puppy’s momma took care of correcting his behavior, but she’s not here anymore. So, Fido Jr. doesn’t have anyone to make him toe the line now…. or does he? Puppies and older dogs can get along fairly well a lot of the time, and your senior dog will tolerate some puppy antics, but he has his lines drawn in the sand. Whether it’s chewing his ears once too often, stealing his bone for the tenth time, or waking him from a nice nap by jumping on his belly, there’s going to be trouble if your new puppy crosses those lines. Most older dogs will curl their lip and give the pup a hard stare as a first warning. If that doesn’t work, a low growl will be next, most likely followed by a snapping of jaws if Jr. is oblivious to more subtle tactics. This is normal, so don’t panic! Most puppies ‘get the message’ really quickly, and this type of correction is universally understood in the dog world. The pup will know he went too far and most likely will yelp, run off, or turn over to show his tummy in submission. Obviously if your older dog bites the pup and draws blood or really hurts him, that’s a no-no. But with friendly, stable dogs this is rare. This is NOT normal, with one caveat… during the first day or so, older dogs may sniff the pup a lot, and follow him around. But this following will be fairly casual, and take the form of curiosity or caution… he wants to know what this strange little dog is doing, and what he smells like! An adult dog who stalks around after the pup on stiff legs, with his ears back, and possibly growling or stomping on the pup, isn’t feeling curious or cautious. He’s not happy. You need to watch this behavior carefully and don’t leave the two of them alone for a minute. If your older dog rushes at the pup, bites him, shakes him, or generally treats him too roughly (and not in a playing kind of way), you need to reprimand him and separate them. When this happens, interaction should be a little less hands-on, perhaps put the pup in a playpen, or use a baby-gate to keep him in the laundry room or mud room, out of harms way. But still allow the older dog to see and sniff him through the mesh or bars…. …. this way they’ll get used to each other from a safe distance to begin with. If, after a few days, you reintroduce them face to face and Fido Sr. still acts as though he thoroughly dislikes this pup, you may need to rethink the situation.